... is guarding the front of her home in the village of Degh, near the border with Azerbaijan. She is 106 years old, and holds an Ak-47. The photo was taken in 1990 during the Nargorno Karabakh War. She was alive during WWI, the Armenian genocide by the Ottoman Empire, the Russian Civil War, the Red Terror, Stalin's Purges, WWII, and the breakup of the Soviet Union. (click the image to better see, what you find in that face). It looks like she means business, armed as she is. Perhaps her instinctive reaction is, with each new manifestation of Man's Inhumanity To Man, to reach for a weapon to defend herself. (Certainly not an Ak-47 with the first atrocities that she survived. Perhaps just a pile of rocks). Yet, time after time, and war after war, she was one day able to say, "Now it is over. They have declared Peace." So one can wonder. What brought each of these conflicts to an end? What was written in the Armistice Agreement, and could the same things have been written before each war, avoiding it altogether? But in placing their confidence in such forms, the authors seemed to forget each time that "form" is impermanent, and should not become the repository of human destiny. Something simpler and more meaningful should be written there. Something like : "No More Hate, Ever." That would merit signing one's name under. Who taught her to defend instead of how to dialogue? Did she teach the same skills of bearing arms to her children, grand-children, great-grandchildren, great-great-grandchildren? Did anyone ever approach her about learning how to make Peace? Probably not. And between the atrocities, did she carry Peace in her heart, or the darkness and anticipation of the next War: The sentiment that there can never be a permanent Peace? Did she participate in the creation of the existence that became Reality for herself and others, filling her heart with hatred which spilled over to manifest in her world? Harsh words aimed at an old granny. She might have thought once: "My heart didn't start out that way," but I'm putting words in her mouth. Or inviting a chicken and egg argument. It's more likely that her response would have been: "Words. Pretty words," as she reached for a second magazine for her Ak-47. Survival of the fittest should come to mean something else. Perhaps what has been written here is a mirage. "Words. Pretty words." An invention born in one's reaction to a photograph of someone we do not know. She is 106 years old. She stares forward with a gaze that suggests she may be blind: perhaps with cataracts or glaucoma. Perhaps the real owner of the Ak-47 simply placed it in her hands and said: "Here grandmother. Hold this. I'm going to take your picture." And if she began shooting, it would mean that she would be blind to who her target really was. Friend, or foe? 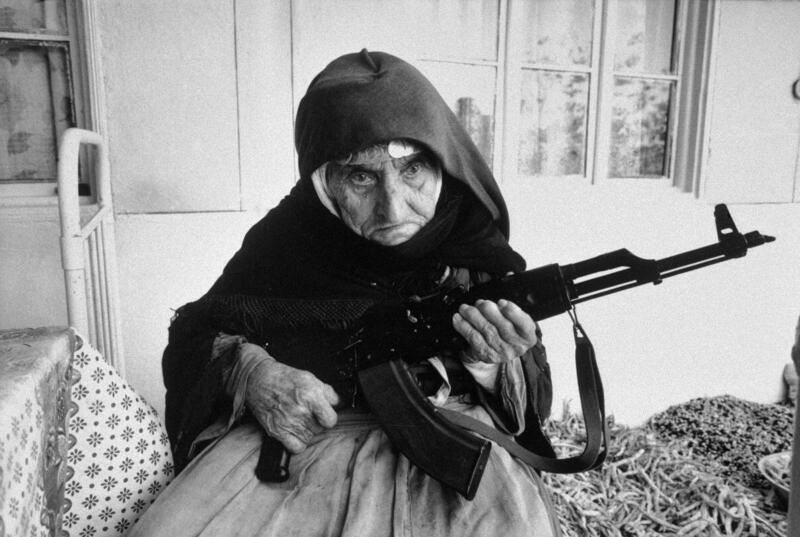 Then again, perhaps the same could be said if the actual owner of the Ak-47 was someone else than this grandmother. Who does he shoot at? Friend or Foe? And how would you know, at a distance? "Uniforms..." might come the answer. Ah..., we wear uniforms to define us more accurately as being the target, or not the target. How ridiculous it would be to stop and ask such a target: "How are you today?" "What are you feeling in your heart?" "Do you miss your family?" The Ak of course, doesn't care. It passes its coldness equally well into any set of hands that decide to take it up. Point it. Squeeze it. It spits its deadly fire from you to them. Those who get in its way are by definition, the enemy: "them." Seems so simple even a child could be taught that.